This is the Tan Family coat of arms. Ain't it cool?! I love it, and so does hubbs. And judging from the comments and "likes" we got for this picture when I changed the profile picture for our Tan Family Chronicles Facebook page just before the weekend - loads of people like it too. Would you like to know what the different components mean? Most of it seems pretty obvious at first glance. But there's kinda a story behind everything, so let me share that with you. The three kids, Isaac (top), Asher (left) and Shawna (right) form the main support of the emblem. The kids are the very heart of our family, and they hold up the shield (symbolising the family unit) in the middle. Isaac is on top because he is the oldest, the first born. When I was pregnant with the twins, Asher was on my left and Shawna was on the right, of my tummy. Hence their respective positions. The top left hand quadrant shows our wedding rings. The lines on the rings are not for show. Our rings are made of white gold and yellow gold. This is because the modern "angmo-fied" me prefers white gold, but "ah beng" hubbs prefers yellow gold. When we saw these rings that combined white and yellow gold, we knew it was just right for us. Hence, the rings represent hubbs and I, joined as one. The yellow of the quadrant with the glow emanating from the middle where the rings are signifies the sanctity of marriage, symbolising that the state of the marriage and relationship between hubbs and I are vital to the health of this family. Spidey resides in the top, right hand quadrant! As many of my friends would know, we're crazy about Spiderman! Okay, okay, it's me, I am the one crazy about Spiderman, but hubbs and the kids have grown to like Spidey as well and they allow me to dress us all up in Spidey garb. People have come to associate Spidey with us as a family, such that many friends call us "The Spidey Family" and think of us when they see anything Spiderman. The rich, red colour symbolised the strength, vitality and passion that we value and hope to have and inculcate in the kids. A stylised symbol of Spidey is used to avoid copyright issues signify uniqueness and creativity, also values we believe in. The bottom left hand represents sports in our lives - not just cycling. Hubbs and I are both very sporty people. He much much more than me, though. The bicycle was chosen as a representative symbol as it is easily recognisable as a symbol of sports. Moreover, cycling is currently the sport which hubbs is engaged in the most often. Isaac has also learnt to cycle on two wheels just a few months ago. I myself love cycling. And this is the sport which we are confident we would be doing a lot of, together, as a family, when the twins get big enough to cycle on their own. We already had our maiden outing cycling as a family when we all went Pulau Ubin cycling together - blog post on that coming up soon! The blue background of the quadrant symbolises the water sports (swimming, kayaking, canyoning etc) and air/sky sports (sky-diving, kite-flying? haha) that we also enjoy. The mannish symbol in the bottom right hard corner is called a "meeple" and it represents boardgames and gaming in our lives. The word meeple is a portmanteau of the words "my" and "people". It is the shape of a pawn that is commonly used in Euro board games. Our closer friends would know that hubbs and I are crazy about board games. Well, me much much more so, than him. I love playing strategy board games and have a sizable personal collection of boardgames numbering a few hundreds. On route playing games with Isaac, starting him on boardgames when he was just 17 months old, I have since moved on to starting an online business importing and retailing boardgames at www.MyFirstGames.sg The green of this quadrant, symbolises the "greener pastures" I hope to be moving towards with this business of mine. As Isaac will be starting Primary 1 in 2013, I hope to be able get the business moving to the extent that it can earn me a modest salary (at least enough for the twins childcare fees!) to quit my full-time job by then and do the business full time. Lastly, the symbol smack in the middle of the shield/coat of arms is the chinese word "Chen" written in old chinese wording. Chen is how we pronounce our surname Tan in chinese. Tan is the anlicised way of spelling the surname. On the scroll below, is simply stated "The Tan Family" as I have yet to think of a motto. Also, it would be good with we have the kids input in thinking up a motto, so that will have to come later. Oh, and in case you were wondering: yes, my surname is Tan, and I married hubbs, whose surname is also Tan. So, yes, I went from Miss Tan to being Mdm Tan, Ms Tan, or Mrs Tan-Tan. Nice surname, yah, Tan? Or maybe I'm biased. So, that's us, in that coat of arms. 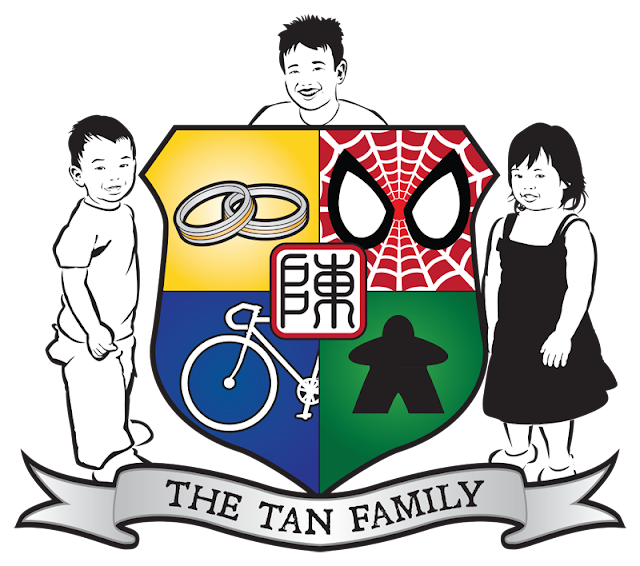 The Tan Family coat of arms. How would YOUR family coat of arms look like? Stay tuned for a post on what inspired me to have this created! This is so meaningful and you must be one of the first families that has a coats of arm. Well I haven't thought what I'll use to symbolise my family. In fact, this has set me thinking about the values that I want in my family.